Ron Jeremy is the ring announcer (no, not that one). Big John McCarthy is our referee, and “The Black Dragon” Ron Van Clief is the new commissioner, which a perfect role for the oldest competitor in UFC history. Here we go! Anderson is from Arlington, Texas, and is 86-0 in bare-knuckle fights. Hess, the Californian, is a "Giant with Attitude" at 6-foot-7, 295 pounds. I can hear you asking what SAFTA is; Hess invented it himself. It’s Scientific Aggressive Fighting Technology of America. Hess comes out slugging, but Anderson gets top control when the fight goes to the mat. Hess gets up and pounds Anderson again, closing his right eye. Down goes Anderson, and McCarthy stops the fight at 1:20. The fans are booing because they wanted to see more. Score one for SAFTA. Medina is from California and is nicknamed “El Tiburon” (the shark). Cureton is called “Thunderfoot” and is a firefighter from Jersey City. Medina grabs a takedown, so Cureton pulls guard. Medina unleashes the headbutts, which he said is one of his favorite weapons. Medina follows up with shots to the body. Cureton can’t escape and taps out at 2:55. “When you don’t know how to grapple, it takes away all your skills,” Jim Brown says. See, he gave props to wrestling! Verdecia is a paramedic from Miami whose co-workers will be in his corner. “My opponents will need them.” What’s going on here? Are firemen and paramedics the toughest guys in every town? Sound off in the comment section! Ernie controls the fight on the mat, but Oleg doesn’t seem worried. Ernie must have watched the last fight because he starts throwing headbutts. Oleg will have none of that and reverses to an anaconda choke for the tap out at 2:20. Severn is the man to beat after going more than 15 minutes with Royce Gracie at UFC 4, but he has to find a way to finish opponents after outwrestling them. Severn has the NWA World title in tow, which was separate from the WCW title at the time. He was basically the king of the independent pro wrestling scene; I know because I announced some shows that he headlined. Charles blows off the generic music and comes out to a hip-hop tune, so he’s the pioneer of the Rap ‘n’ MMA Connection, if there is such a thing. The battle of 260-pounders begins with Severn working at a furious pace. Takedown, side control, knee to the face. Severn launches a series of punches and Charles is bleeding from the head. A rear naked choke wins at 1:39 and Severn pumps up the crowd! Looks like Severn is here to finish people tonight. John Hess dropped out due to a bruised hand, so Dave Beneteau takes his place as the top-bracket alternative. If I’m Guy Mezger, I am calling every lawyer I know. Beneteau is a paramedic from Windsor, Ontario, Canada. Okay, I get it. I won’t pick a fight with anyone at the firehouse. Not even the dog. Medina’s eye is swollen from the first fight. Beneteau takes Medina down and headbutts him right in his bad eye. Beneteau lands some strong right hands, and Medina can’t get anything going. The Beneteau barrage continues and the towel comes in. Beck says this could be a showstopper, and I agree. Severn has a 55-pound weight advantage. Giving up lots of pounds to a heavyweight? I told you Oleg was like Fedor. Severn gets the takedown and delivers a knee to the face. It worked last time. The fans chant “USA!” Severn has total control and is destroying Taktarov with knees to the eye and headbutts. Taktarov is a bloody mess and the ref stops the fight. Severn is a finishing machine! “He’s added a lot to his arsenal,” Brown says. Credit where it’s due. This is a rematch of UFC 1, in which Gracie beat Shamrock en route to winning three of the first four UFCs. Shamrock gets a takedown and Gracie pulls guard. Blatnick says this could be a long fight. He’s right. Gracie tries some heel strikes to the kidneys. Shamrock counters with some headbutts. We pass the 15:47 mark (Gracie vs. Severn from UFC 4), so this is now the longest fight in UFC history. Gracie tries a few palm strikes. We hit the 30-minute time limit, but the match doesn’t stop. At 31:06, the ref stops the fight and we go to a five-minute overtime. After big right from Shamrock, we go right back to Shamrock on top and Gracie pulling guard. It’s an overtime draw at 36:06 as the fans pour on the boos. They grapple to a stalemate for the first two minutes. Severn finally gets the takedown and gets an armlock for the submission! 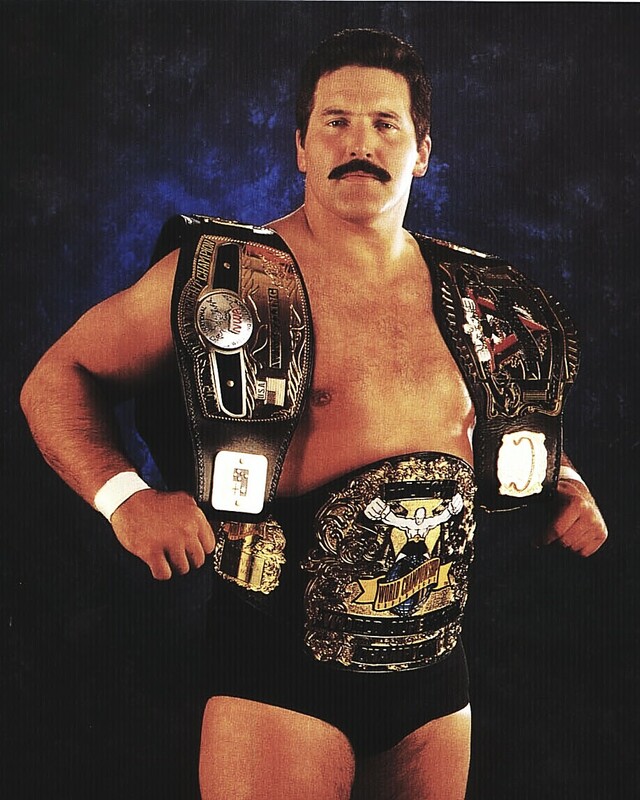 Dan Severn wins UFC 5 and $50,000. He holds up the UFC 5 tournament title belt (another first) along with the NWA belt. It’s a great day to be Dan Severn.